Network Functions Virtualization (NFV) is a software-based solution that helps the Communication Service Providers (CSPs) to move beyond the traditional, proprietary hardware to achieve greater efficiency and agility while reducing the operational costs. An NFV environment allows for IT and network convergence by providing a virtualised infrastructure using the standard virtualization technologies that run on standard hardware devices such as switches, routers, and storage to virtualize network functions. The management and orchestration logic deploys and sustains these services. NFV also includes a Systems Administration, Automation and Life-Cycle Management that reduces the manual work necessary. It ensures that people use modern tools, for example, devops, to work faster and at a larger scale. Accelerates the time-to-market by allowing you to to quickly deploy and scale new networking services to address changing demands. Supports innovation by enabling service developers to self-manage their resources and prototype using the same platform that will be used in production. Addresses customer demands in hours or minutes instead of weeks or days, without sacrificing security or performance. Reduces capital expenditure because it uses commodity-off-the-shelf hardware instead of expensive tailor-made equipment. Reduces operational costs by streamlined operations and automation that optimizes day-to-day tasks and improves employee productivity. Red Hat OpenStack Platform supports NFV deployments with the inclusion of automated OVS-DPDK and SR-IOV configuration. Customers looking for a Hyper-converged Infrastructure (HCI) solution can now colocate the Compute sub-system with the Red Hat Ceph Storage nodes. This hyper-converged model delivers lower cost of entry, smaller initial deployment footprints, maximized capacity utilization, and more efficient management in NFV use cases. Red Hat OpenStack Platform also supports, with limitations, the deployment of Technology Preview services such as OVS hardware offload. For more information on the support scope for features marked as technology previews, see Technology Preview. You can now use composable roles to create custom deployment roles. Composable roles allow you to add or remove services from each role. For more information on the Composable Roles, see Composable Roles and Services. Red Hat offers an open-source based cloud-optimized solution to help the Communication Service Providers (CSP) to achieve IT and network convergence. Red Hat adds NFV features such as SR-IOV and DPDK-OVS to Red Hat OpenStack. NFV Infrastructure (NFVi) - the physical resources (compute, storage, network) and the virtualization layer that make up the infrastructure. The network includes the datapath for forwarding packets between virtual machines and across hosts. This allows you to install VNFs without being concerned about the details of the underlying hardware. NFVi forms the foundation of the NFV stack. NFVi supports multi-tenancy and is managed by the Virtual Infrastructure Manager (VIM). Enhanced Platform Awareness (EPA) improves the virtual machine packet forwarding performance (throughput, latency, jitter) by exposing low-level CPU and NIC acceleration components to the VNF. NFV Management and Orchestration (MANO) - the management and orchestration layer focuses on all the service management tasks required throughout the life cycle of the VNF. The main goals of MANO is to allow service definition, automation, error-correlation, monitoring, and life cycle of the network functions offered by the operator to its customers, decoupled from the physical infrastructure. This decoupling requires additional layers of management, provided by the Virtual Network Function Manager (VNFM). VNFM manages the life cycle of the virtual machines and VNFs by either interacting directly with them or through the Element Management System (EMS) provided by the VNF vendor. The other important component defined by MANO is the Orchestrator, also known as NFVO. NFVO interfaces with various databases and systems including Operations/Business Support Systems (OSS/BSS) on the top and the VNFM on the bottom. If the NFVO wants to create a new service for a customer, it asks the VNFM to trigger the instantiation of a VNF, which may result in multiple virtual machines. Systems Administration, Automation and Life-Cycle Management - manages system administration, automation of the infrastructure components and life cycle of the NFVI platform. Red Hat Satellite and Ansible by Red Hat - Optionally provide enhanced systems administration, automation and life-cycle management. The Red Hat OpenStack Platform director installs and manages a complete OpenStack environment. The director is based on the upstream OpenStack TripleO project, which is an abbreviation for "OpenStack-On-OpenStack". This project takes advantage of the OpenStack components to install a fully operational OpenStack environment; this includes a minimal OpenStack node called the undercloud. The undercloud provisions and controls the overcloud (a series of bare metal systems used as the production OpenStack nodes). The director provides a simple method for installing a complete Red Hat OpenStack Platform environment that is both lean and robust. Include SR-IOV, and PCI Passthrough parameters to your network-environment.yaml file, update the post-install.yaml file for CPU tuning, modify the compute.yaml file and run the overcloud_deploy.sh script to deploy the overcloud. Install the DPDK libraries and drivers for fast packets processing by polling data directly from the NICs. Include the DPDK parameters to your network-environment.yaml file, update the post-install.yaml files for CPU tuning, update the compute.yaml file to set the bridge with DPDK port, update the controller.yaml file to set the bridge and an interface with VLAN configured and run the overcloud_deploy.sh script to deploy the overcloud. For required NFV planning guidelines and configuration, see Network Function Virtualization Planning and Configuration Guide. See Director Installation and Usage for guidance on hardware selection for OpenStack nodes. Application readiness - Network vendors are currently in the process of transforming their devices into VNFs. Different VNFs in the market have different maturity levels; common barriers to this readiness include enabling RESTful interfaces in their APIs, evolving their data models to become stateless, and providing automated management operations. OpenStack should provide a common platform for all. Broad use-cases - NFV includes a broad range of applications that serve different use cases. For example, Virtual Customer Premise Equipment (vCPE) aims at providing a number of network functions such as routing, firewall, VPN, and NAT at customer premises. 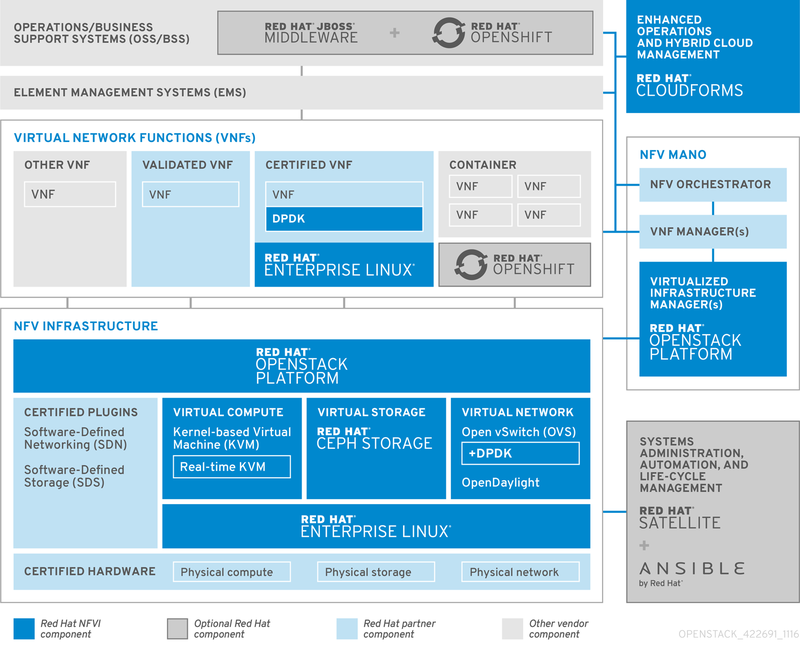 Virtual Evolved Packet Core (vEPC), is a cloud architecture that provides a cost-effective platform for the core components of Long-Term Evolution (LTE) network, allowing dynamic provisioning of gateways and mobile endpoints to sustain the increased volumes of data traffic from smartphones and other devices. These use cases are implemented using different network applications and protocols, and require different connectivity, isolation, and performance characteristics from the infrastructure. It is also common to separate between control plane interfaces and protocols and the actual forwarding plane. OpenStack must be flexible enough to offer different datapath connectivity options. Direct hardware access bypasses the Linux kernel and provides secure direct memory access (DMA) to the physical Network Interface Card (NIC) using technologies such as PCI Passthrough (denominated SR-IOV PF in OpenStack now) or single root I/O virtualization (SR-IOV) for both Virtual Function (VF) and Physical Function (PF) pass-through. Using a virtual switch (vswitch), implemented as a software service of the hypervisor. Virtual machines are connected to the vSwitch using virtual interfaces (vNICs), and the vSwitch is capable of forwarding traffic between virtual machines, as well as between virtual machines and the physical network. Single Root I/O Virtualization (SR-IOV) is a standard that makes a single PCI hardware device appear as multiple virtual PCI devices. It works by introducing Physical Functions (PFs) that are the full-featured PCIe functions representing the physical hardware ports and Virtual Functions (VFs) that are lightweight functions that can be assigned to the virtual machines. The virtual machines see the VF as a regular NIC that communicates directly with the hardware. NICs support multiple VFs. Open vSwitch (OVS) is an open source software switch that is designed to be used as a virtual switch within a virtualized server environment. OVS supports the capabilities of a regular L2-L3 switch and also offers support to the SDN protocols such as OpenFlow to create user-defined overlay networks (for example, VXLAN). OVS uses Linux kernel networking to switch packets between virtual machines and across hosts using physical NIC. OVS now supports connection tracking (Conntrack) and built-in firewall capability. This avoids overhead of Linux bridge with iptables/ebtables. Open vSwitch for Red Hat OpenStack Platform environments offer out-of-box OpenStack Networking (neutron) integration with OVS. Data Plane Development Kit (DPDK) consists of a set of libraries and poll mode drivers (PMD) for fast packet processing. It is designed to run mostly in the user-space, enabling applications to perform their own packet processing directly from or to the NIC. DPDK reduces latency and allows more packets to be processed. DPDK Poll Mode Drivers (PMDs) run in busy loop, constantly scanning the NIC ports on host and vNIC ports in guest for arrival of packets. DPDK accelerated Open vSwitch (OVS-DPDK) is Open vSwitch bundled with DPDK for a high performance user-space solution with Linux kernel bypass and direct memory access (DMA) to physical NICs. The idea is to replace the standard OVS kernel data path with a DPDK-based data path, creating a user-space vSwitch on the host that uses DPDK internally for its packet forwarding. The advantage of this architecture is that it is mostly transparent to users. The interfaces it exposes, such as OpenFlow, OVSDB, the command line, remain mostly the same. Similarly, physical NICs are placed in PCI slots on the Compute node hardware. These slots connect to specific CPU sockets that are associated to a particular NUMA node. For optimum performance, connect your datapath NICs to the same NUMA nodes in your CPU configuration (SR-IOV or OVS-DPDK). OpenStack Compute makes smart scheduling and placement decisions when launching instances. Administrators who want to take advantage of these features can create customized performance flavors to target specialized workloads, including NFV and High Performance Computing (HPC). Remote memory available via Interconnect is accessed only if VM1 from NUMA node 0 has a CPU core in NUMA node 1. 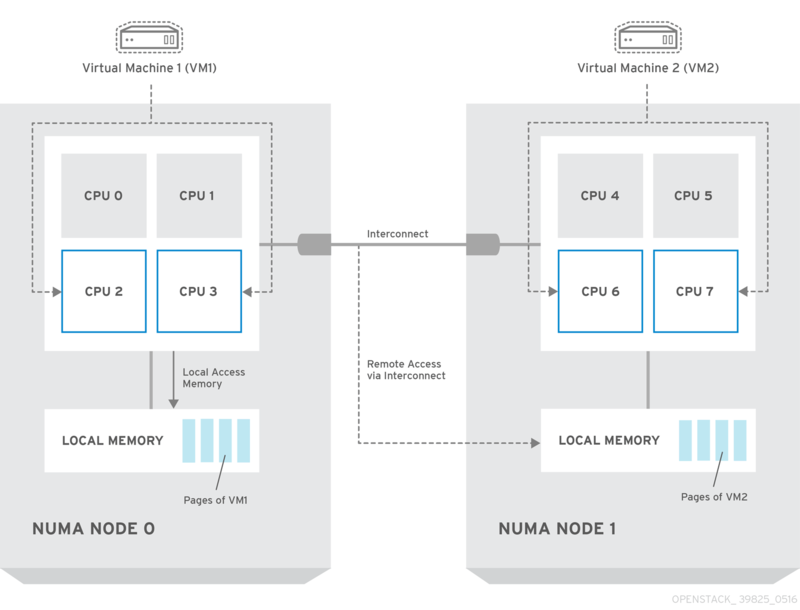 In this case, the memory of NUMA node 1 acts as local for the third CPU core of VM1 (for example, if VM1 is allocated with CPU 4 in the diagram above), but at the same time, it acts as remote memory for the other CPU cores of the same VM. See Configure CPU Pinning with NUMA for further information. Physical memory is segmented into contiguous regions called pages. For efficiency, the system retrieves memory by accessing entire pages instead of individual bytes of memory. To perform this translation, the system looks in the Translation Lookaside Buffers (TLB) that contain the physical to virtual address mappings for the most recently or frequently used pages. If a mapping being searched for is not in the TLB, the processor must iterate through all the page tables to determine the address mappings. This results in a performance penalty. It is therefore preferable to optimise the TLB so as to ensure the target process can avoid the TLB misses as much as possible. The typical page size in an x86 system is 4KB, with other larger page sizes available. Larger page sizes mean that there are fewer pages overall, and therefore increases the amount of system memory that can have its virtual to physical address translation stored in the TLB. As a result, this lowers the potential for TLB misses, which increases performance. With larger page sizes, there is an increased potential for memory to be wasted as processes must allocate in pages, but not all of the memory is likely required. As a result, choosing a page size is a trade off between providing faster access times by using larger pages and ensuring maximum memory utilization by using smaller pages. Red Hat OpenStack Platform is supported on Red Hat Enterprise Linux 7.4. For information on installing Red Hat Enterprise Linux, see the corresponding installation guide at: Red Hat Enterprise Linux Documentation Suite. To install OpenStack components and their dependencies, use the Red Hat OpenStack Platform director. The director uses a basic OpenStack installation as the undercloud to install, configure and manage the OpenStack nodes in the final overcloud. Be aware that you will need one extra host machine for the installation of the undercloud, in addition to the environment necessary for the deployed overcloud. For detailed instructions, see Red Hat OpenStack Platform Director Installation and Usage. For more details on planning and configuring your Red Hat OpenStack Platform deployment with SR-IOV and OVS-DPDK, see Network Function Virtualization Planning and Configuration Guide.